One weekafter two anomalous events caused a snag in NASA's attempt to revive the HubbleSpace Telescope, the orbital observatory is nearly back up and running, withscience operations set to resume this weekend. "Weare up to the same place we were at about 8 o'clock Wednesday night of lastweek," with the telescope control systems running, but its instrumentsstill in safe mode, said Art Whipple, manager of the HubbleSystems Management Office at NASA's Goddard Space Flight Center inGreenbelt, Md. The newglitches cropped up while engineers were attempting to switch to a backupdata relay channel in the 18-year-old observatory's Science Instrument Controland Data Handling system after the primary channel failedon Sept. 27. The primary channel, called Side A, had been working properlysince the telescope launched in April 1990. The data relay channels allow thespacecraft to send its images of the cosmos back to Earth. The switchto the backup channel, called Side B, was a tricky maneuver that required theactivation of five other backup systems that had also been in hibernation sinceHubble's launch. Themaneuvering "just made the timing too tight," Whipple said in aThursday teleconference. 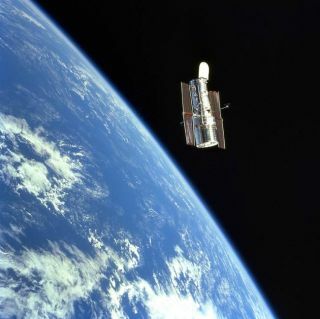 One of theglitches occurred when a component of Hubble's main camera returned a lowerthan normal voltage, while the other involved a communications drop between thespacecraft's main computer and the one that controls its science instruments,called the payload computer. Theglitches caused both the payload computer and the Side B data formatter toreset. The switch to Side B was, however, successful, and as of 11:15 a.m. EDT (1515GMT) today, the payload computer was back up and running. Whatexactly caused the reset is remains a mystery, Hubble managers said. "Wecannot know the exact cause, of course, because we cannot get to the hardware.All we can say is that it appears to have been to have been an electrical event,"Whipple said, ruling out any software or commanding errors. Whipple saidthat "it is possible that we may see another event of this type in thefuture." Fortunately,the electrical event "does not appear to have done any permanent damage,"Whipple said. If thepayload computer stays operational for the remainder of this week, the Hubble teamwill switch on the telescope?s Wide Field Camera 2 and once more resume scienceoperations. The initialglitch with the Side A relay channel postponed the planned Oct. 14 launch ofthe space shuttle for its next, and last, Hubble repair mission until early2009. Every month that the shuttle mission to service Hubble is delayed costsNASA $10 million, mission managers have said. When theastronauts do getup to Hubble, they hope to replace the tray that houses both Sides A and B.The mission is also slated to install a new camera, replace gyroscopes andbatteries, upgrade Hubble's guidance equipment and add a docking ring.